This post was written by Neil Coker, APRL Reference Assistant. While on a road-trip around Lake Ontario, I had the opportunity to pay a visit to the Harry Sutherland Philatelic Library, one of the partner libraries in the Philatelic Union Catalog hosted by the APRL. One of the directors, Charles Verge, gave me a tour of the library and of the Vincent Graves Greene Philatelic Foundation, which share offices. The library is just north of downtown Toronto in a small office building. 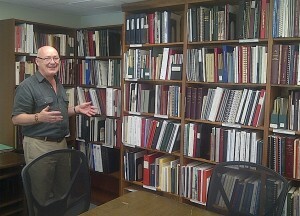 Their main focus is on Canada and BNA literature, for which they have a large selection with its own cataloging system! Due to good communication between our libraries, and various stages of “spring cleaning” at both locations, we were able to supply each other with materials that were duplicates for one library but needed at the other. This included books, auction catalogs, back issues of journals and philatelic exhibition programs. I was able to “smuggle” several boxes across the border, and brought even more back home. So be sure whenever you donate material that we already own, we try our best to find a good home for it!